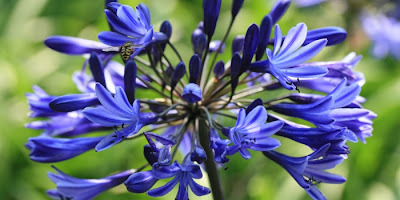 Agapanthus species are a family of hardy and half hardy perennial plants which grow in compact clumps, and have fleshy roots. About ten species are botanically recognised, but due to their readiness to hybridize between species classification of all agapanthus can be confused. Most of the species in common cultivation, and particularly the well-known hybrids are hardier than generally supposed and can be grown outdoors in the south and west of Great Britain. In colder regions they will require a sheltered, sunny border with protection over the winter period. The widely to narrowly funnel shaped flowers are 1-3 inches long, and are produced in round umbels. Flowering begins in July and continues until August, sometimes September depending on the weather and variety. 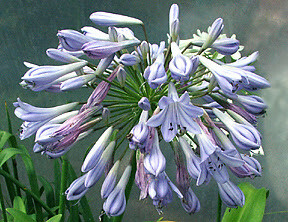 Agapanthus 'Headbourne Hybrids' are considered to be one of the hardiest forms of agapanthus that can be readily purchased. They can grow to a height of 2-3 ft and if you want to grow a drift of them they will require a planting distance of 15-18 inches apart. Their erect flowering stems carry spherical umbels of deep violet-blue to pale blue flowers. Agapanthus will thrive in any fertile, well drained soil so long as they have a sheltered position - especially in colder areas. If you have purchased bare-root agapanthus then these can be planted outdoors in April, setting the crowns about 2 inches below the soil level. Do not disturb the roots after planting! Water well during the growing season and cut back the flowering stems after flowering - unless the seeds are required for propagation. In cold areas, protect the root system from October to April with a 6-9 inch deep layer of dry mulch such as straw, bracken, weathered ashes or coarse sand.